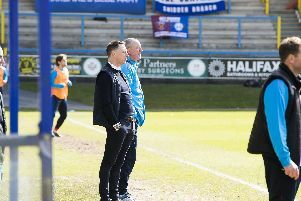 FC Halifax Town boss Neil Aspin felt his side did enough to win the game after they drew 1-1 at Lincoln but hasn’t given up hope of reaching the play-offs. Lois Maynard grabbed a 90th minute equaliser after Hamza Bencherif had given Lincoln a half-time lead. But fifth-placed Forest Green’s win at Chester has left Town six points adrift of the play-offs with four games left, although Halifax have played a game less. Aspin said: “In the first-half we had some good chances and didn’t take them. “We’ve put countless throw-ins into the box so conceding from is very disappointing. “I was happy with the way we played in the first-half, I couldn’t fault the players, everything about the team and the performance I was happy with, it was just the end product. “In the second-half I felt we were the team that were pushing the most and we certainly deserved getting something at the end but we could have done with getting it earlier to give us more time to try and get the winner. “But the players are giving their all, they’re showing they’re willing to keep going for the full 90 minutes. Aspin was impressed by Town forward Jack Muldoon, who did everything but score in the game. “I’ll never criticise players for missing chances,” said the Halifax boss. “I thought he worked exceptionally hard, he was closing the full-backs down and he was a threat in the first-half. “If the players work as hard as that I can’t ask for any more. Aspin admitted he thought Town’s hopes of an equaliser may have gone before Maynard’s late leveller. “As the time was running down and they were taking longer and longer to take their goal-kicks you’d have to think it didn’t look like we were going to get a goal,” he said. “And that would have left a really bitter taste in the mouth. “Obviously one point doesn’t move you forward but in terms of how you’re feeling and how the supporters feel there’s a difference travelling back with a draw rather than a defeat. Aspin was pleased with Maynard’s contribution and revealed the midfielder’s below-par early season form stemmed from missing out on a move to the Football League. “Lois has done really well for me,” said Aspin. “I think he was disappointed at the start of the season because he had a chance to move higher and that got turned down. “It’s easy to say you’ve got to get on with it but it does affect you. “He’s not been used to that sort of decision and I think it took a bit of a toll on Lois. “His goal return’s been excellent this season. “I don’t think at times he’s played as well as last season but today I thought he did. “He was excellent. I gave him a gee-up before the game and he certainly responded. “His performance today was really good and with his hard work he got the reward with the goal. “It was a great strike. He’s chipped in with a lot of goals this season. The Town chief felt Lincoln’s Tom Miller should have been sent-off for a crude tackle on Maynard in the first-half. “I thought it was a straight red,” he said. “The lad should have been booked earlier so it would have been a second yellow anyway. “We didn’t get that and we got a terrible decision where he gave a foul against Jack Muldoon when he would have been running through on goal. “I don’t think we got a fair share of the fouls but it’s not about that. Aspin was disappointed at the manner of Lincoln’s goal, which came straight from a long-throw, but is determined to keep fighting for a top-five finish. He added: “To come here and dominate like we were doing shows we were playing well. “But it’s always about what you do in the boxes and defensively to lose a free header from a long-throw was poor. “But from the chances we created we should be coming in at half-time winning the game, not losing. “But we keep going, every game you play you’re always looking at what you need to improve on. “We’ve tried a couple of different formations. “Sometimes I’m happy with, sometimes you can see it needs more work on it and players need to understand the positions they’re playing in. “Hopefully we’ll get the time in the summer to work on a few things and we have to try and come back stronger but I haven’t given up hope. “We’ve got 12 points to play for, we keep saying it every game, but we’re capable of beating anyone. “I know we’re capable of drawing with anyone as well!